Corporate Seals | Royal Rubber Stamp Co. Ltd. | "Since 1957"... Order Today!... Ship Today! "Since 1957"... Order Today!... Ship Today! Our goal is to make your shopping experience as convenient as possible. Our embossing corporate seals have a 4 hour turnaround time, so if you order in the morning your seal can be picked up the SAME DAY later that afternoon. RUSH orders can be accommodated. Please contact us directly at 780.426.4676 if your order is time sensitive. 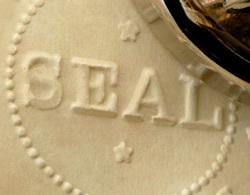 Corporate Seals are typically used for embossing papers and documents for official use. 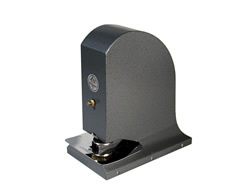 All embossing seals are designed for standard 20lb single sheets of paper only. We carry a complete line of seals from manual to electric. Rubber Stamp Style Corporate Seal â�� most economical however not accepted by all lawyers and/or banks. Our most popular embossing corporate seal. Sits on a flat surface and paper is inserted between the 2 plates; a raised impression is made when the handle is pressed down. A popular embossing seal with some lawyers because of the capability of being stacked on top of each other. A popular seal used for Notary Publics. Hand Held model; comes with a case for ease of transport. #1 Long Reach Seals are most commonly used for Logo Seals; #2 Long Reach Seals are used when larger impressions are required. Logo seals are often used on wedding invitations, anniversaries and Christmas cards. Seals can be customized with “From the Library of”, or with “From the Kitchen of: customized with your initials in the middle."